This is lenghty again. Best to go to our website and read About Us. West Virginia Shetland Sheepdog Rescue, Inc. The Shetland Sheepdog is related to the Rough Collie, both dogs descended from Border Collies that inhabited Scotland. The Border Collies were brought to the Scottish island of Shetland and crossed with the Icelandic Yakkin, a small island dog which is now extinct. By 1700, the Sheltie was completely developed. The dogs were used to herd and guard the sheep flocks of the Shetlands. This willing worker was very gentle when herding the miniature stock. Loyal, smart, eager to please. Docile, alert and great temperaments. Loving, affectionate, needs to be part of the family. Sensitive to the tone of your voice, so be careful. Lively and easy to train. Considered one of the smartest breeds of dogs. Keep them busy, they need and love mental stimulation. Great herder, so watch your ankles [just kidding!]. This breed was bred to command large cattle and hold small sheep in check. Herding instinct is very strong, and they love to chase things. Should not be allowed off leash near moving cars ~ they instinctively love to chase moving cars. Can be suspicious of strangers and children initially. If forced on strangers can demonstrate persistent barking, which can lead to guarding, snapping and even nipping. Do not overfeed, they love food and can gain weight easily. Lives well in apartment lifestyles. Varying degrees of negative behavior can develop when a dog feels it is the alpha/leader. These traits can be reduced to zero if the owner displays proper leadership skills to relieve mental and physical energy. Aside from a bit of extra work for grooming, Shetland Sheepdogs are great companion dogs because they are loyal, affectionate, intelligent and very willing to please. They are excellent family members and do great with children in part because they are an active dog with a kind temperament. The only caution with children is that the Sheltie is a small breed of dog and can be easily injured so supervision is necessary. They are also prone to nipping at ankles because of their herding instincts. Shelties are somewhat wary of strangers which makes the breed good watch dogs. There is a need for the Shetland Sheepdog to be well socialized from the start of ownership so they are trained when to guard and when it is acceptable for a stranger to the dog to be in the home. Often a Sheltie can be trained to give 2 to 3 barks to alert you to a visitor at the door or a stranger on the property. Most Shetland Sheepdog puppies learn to socialize well as long as they are often put in social situations where they can learn how to adapt to people and other beings they are not used to seeing. Some Shelties have the undeserving reputation of being too vocal, however as they are very intelligent dogs this can be quickly over come with good training and become great watch dogs because they are so loyal. The Shetland Sheepdog is considered to be one of the smartest dog breeds available ranking around 6th out of 132 different dog breeds tested for intelligence. The Sheltie can be an excellent pet no matter the gender of the dog as both male and female dogs are much the same in their kind temperament and inherent need to please their owner. The sweet disposition of the Shetland Sheepdog will make it a great pet as well as a vocal watch dog that will add security and piece of mind to your home and family. The Shetland Sheepdog is a breed that will alert you to strangers in it's territory, however it is not a dog that will aggressively attack unless repeatedly provoked by someone or something. The herding instinct will cause most Shelties to nip at ankles and chase cars so supervision is necessary if there is no fence or with very young children. The nipping and chasing of this breed is not an aggressive act simply a herding mechanism and instinct and is most often without injury and generally not painful. A Shetland Sheepdog generally only needs to be brushed once every one or two weeks when regular bathing is practiced. Shelties are very clean dogs and will tend to their coats themselves for the most part however it is up to the owner to brush the dog free of excess hair and remove mattes and tangles. It is also common practice to have your Shetland Sheepdog's hair cut in a fashion that keeps it from dragging the ground which further protects the beauty and clean cut look of the dog's coat. In warmer climates and seasons of high shedding there is an additional need for brushing the Shelties coat so the dog's coat does not tangle and hold the excess released hair. The warmer seasons will cause the Shetland Sheepdog to shed much of it's under coat so the dog is not uncomfortably hot and extra shampooing and brushing is needed in these seasons of high shedding to work the released hair out through the top coat so as not to become entangled and matted with in the remaining coat. Shelties are lithe, agile and active dogs that will need both mental and physical challenges to keep them happy. Because they are descendants of herding dog breeds they are prone to chasing things such as animals, children, people and anything else that will cause visual stimulation or movement for chase. In other words they will most often try to "herd" anything that is movable in their yards. Also because of their ancestry Shetland Sheepdogs should have a large outdoor space to run and be active in. This space should be an enclosed space for safety but large enough for the dog to run and release the natural energy of the breed. Exercise for Shetland Sheepdogs can range from a game of fetch to simply release in an large open area where they can run free. However most owners will want any open area to be fenced as the instincts of this breed will be to chase or herd any distraction they may find. The dog will give chase to small or larger animals and may not over ride it's instincts to return when you call. Most often an average sized yard is big enough for this small breed to be adequately exercised without other means depending on your lifestyle. Shelties are very smart and can easily be trained to play Frisbee or fetch with any number of items. 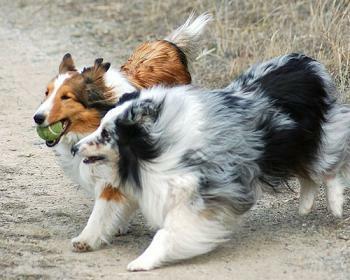 Shetland Sheepdogs are very good runners and will be happy to run or jog with you for exercise as well. Although they are very intelligent and easily trained without training they will most often pull at the leash because of the instinct to be free, run and heard other animals. This is easily and often quickly corrected through early training with the right methods. Because of the great intelligence of the breed of Shetland Sheepdogs training is usually a simple and successful matter. Especially when training is started early in puppy years or as a young dog. However even older Shetland Sheepdogs are trainable with the right methods. The best results will be through a professional training class with the right trainer and technique where your Sheltie can be trained and socialized at the same time. This is generally a successful route for training as this breed of dogs is very intelligent and will learn quickly. Part of their general demeanor is to obey quickly and eagerly making them train exceptionally well, this is largely due to the herding instincts that is inherent in Shetland Sheepdogs and other herding breeds.